Mumbai: INS Betwa will be made upright and seaworthy again in the shortest possible time, the Indian Navy said here on Tuesday after navy chief Admiral Sunil Lanba visited the naval dockyard here where the accident took place. The 3,850-tonne guided missile frigate slipped and keeled over while undocking on Monday at the naval dockyard in Mumbai, where it was undergoing a refit. The accident left two naval personnel, Rai and Ashutosh Pandey, dead and 14 others injured. Admiral Lanba, who rushed here late Monday night after the accident, visited the naval dockyard on Tuesday and also met the injured personnel. An official statement said the navy chief during his visit was briefed on the incident and the options available to salvage the Brahmaputra-class vessel. He directed that the ship "in due course of time be made upright and her refit completed to rejoin the fleet". Admiral Lanba also met the family of one of the deceased, N.K. Rai, and visited INHS Asvini in Colaba to meet the injured personnel, the navy said in a statement. The navy is making arrangements to fly out the mortal remains of the two deceased -- Rai to Varanasi in Uttar Pradesh, and Pandey to Satna in Madhya Pradesh -- by a Service aircraft on Wednesday.Simultaneously, the Navy has set up a Board of Inquiry, headed by Rear Admiral Deepak Bali, Flag Officer, Offshore Defence Advisory Group, which has since started a technical evaluation to make the Betwa upright. 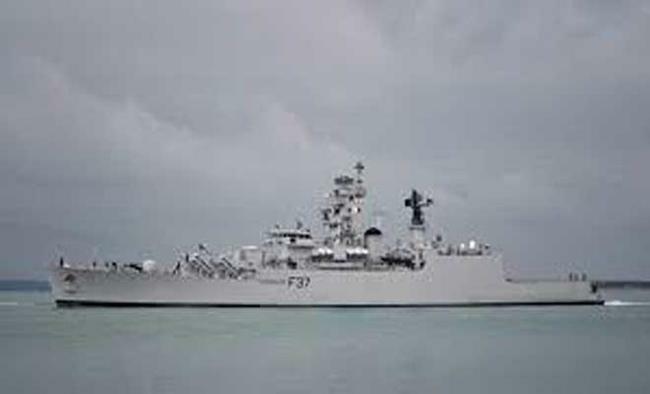 A specialist team is expected to arrive in Mumbai on Wednesday and complete its initial assessment within a couple of days on the extent of damage the battle ship has suffered and chalk out plans to make the 126-metre frigate upright.A navy statement on Tuesday said the ship "slipped from her dock blocks and listed (tilted) to her port side". One of the key warships of the Western Naval Command commissioned in 2004, INS Betwa is armed with anti-ship missiles, Barak 1 surface-to-air missiles and torpedoes, and has taken part in several domestic and international operations. Incidentally, in an earlier mishap, INS Betwa had reported a cracked sonar dome in January 2014, or the bottom of the vessel, which was the subject of a probe. This is the third major serving Indian warship involved in a major accident while docked for repairs in the past five years.In August 2013, 18 sailors were killed when INS Sindhurakshak submarine caught fire in the Mumbai harbour.In February 2014, a major fire broke out aboard nuclear submarine INS Sindhuratna and left two officers dead.